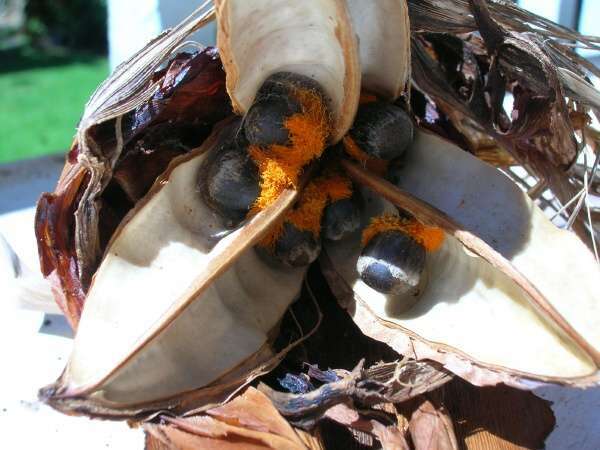 We were asked how and where the Strelitzia seeds are made and especially if this is possible at home. 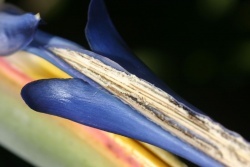 This is why we describe in this article the fertilization of the Strelitzia (Bird of paradise). 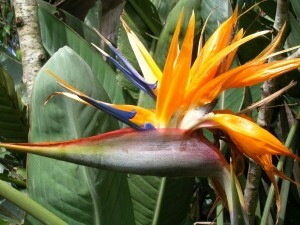 The Strelitzia (Bird of paradise) is protandrical. This means that this monoicous plant is undergoing a certain development to prevent self-pollination. But even if the pollen is collected first and then applied to the stigma, this will not lead to fertilisation. This means that several plants are needed to pollinate the flower successfully. 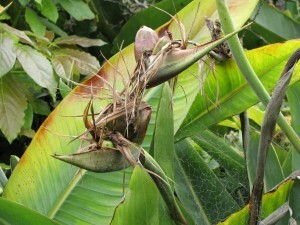 Who fertilizes the Strelitzia in nature is not completely clear and is still being researched. It is known that insects, including bees, do visit the flower. The flower is also visited by honeysuckers (Nectariniidae) but it seems as if this bird is able to reach the nectar without touching the fertile parts of the flower. On the horn-shaped horizontal sepal, 4 to 6 flowers are formed with bright orange petals. The fertile parts are in the horizontal blue’ arrow’. The stamens become visible when the wings on the back of the blue arrow are pressed together. 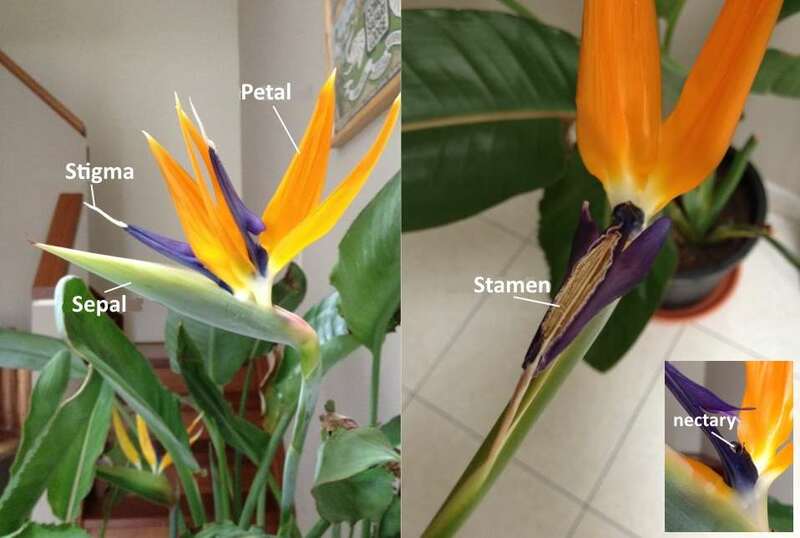 The stigma is the white tip at the front of the blue arrow, which becomes sticky and therefore receivable as soon as the stamens no longer spread pollen. 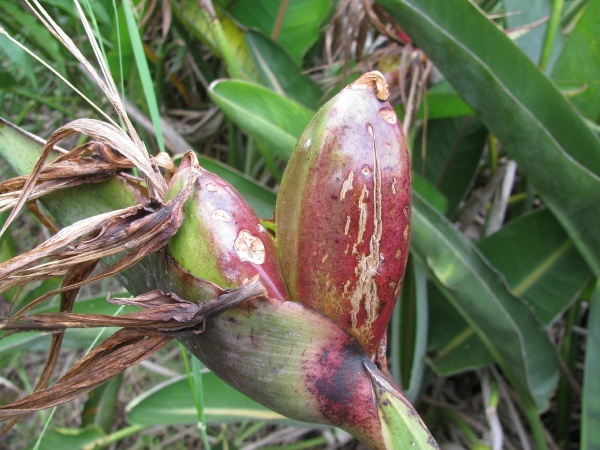 As indicated earlier, the plant cannot fertilize itself. However, the Strelitzia is often sold planted as several plants in one pot. When these different plants bloom, they can be fertilized by hand. First the pollen must be collected. This can be done by gently opening the stamens and carefully run the tip of a straw over the stamens from base to tip. The pollen can then be stored in the refrigerator. As soon as another plant blooms and the stigmas are receptive (sticky), the collected pollen can be sprinkled onto the stigmas. Approximately four weeks after successful fertilisation, a seedpod of the size of a passion fruit is formed in the horizontal sepal. This seed box is divided into three compartments and can contain up to 80 hard round black seeds with the typical orange threads. When the seed is ripe, the seed boxes burst open.